From my friends and colleagues at AhaMedia: “Culture Days is a collaborative, Canada-wide volunteer movement to raise the awareness, accessibility, participation and engagement of all Canadians in the arts and cultural life of their communities. The first annual Culture Days event swept across more than 700 Canadian cities and towns during the last weekend of September 2010, generating an extraordinary amount of enthusiasm in the process. This year’s Culture Days weekend will take place on September 28, 29 & 30. … Once again, the event will feature free, hands-on, interactive activities that invite the public to participate “behind the scenes”—and to discover the world of artists, creators, historians, architects, curators, and designers at work in their community.” It will be a beautiful weekend for the event. I’m looking forward to stopping by. It will provide a lovely break in a weekend of marking student reports (though that, too, will be a lovely time). Dr. Szasz was “an author of mine,” for Prometheus Books Inc., back in the day. I was lucky to meet him once in person, on his 74th birthday, at his house near Syracuse, as the guest of his brilliant daughter, Suzy Szasz, also “an author of mine.” Drinking Johnny Walker Black with him and his daughter and their friends, and talking about drug laws and politics in the kitchen … that was indeed a very good day and evening. I’ve given Dr. Szasz’s The Untamed Tongue: A Dissenting Dictionary to numerous friends and former students. It is just so beautifully put together, limpid and witty. He has a piece in On the Barricades: Religion and Free Inquiry in Conflict, which I coedited (the book was a “greatest hits” collection from Free Inquiry magazine). His essay, “Tea and Sympathy on the Way to Mecca,” is adjacent to one I contributed (on “New Age Gurus”). Final panel from Joe Sacco’s piece “The Unwanted,” which describes the often hostile reception African asylum-seekers have received in the small island nation of Malta. 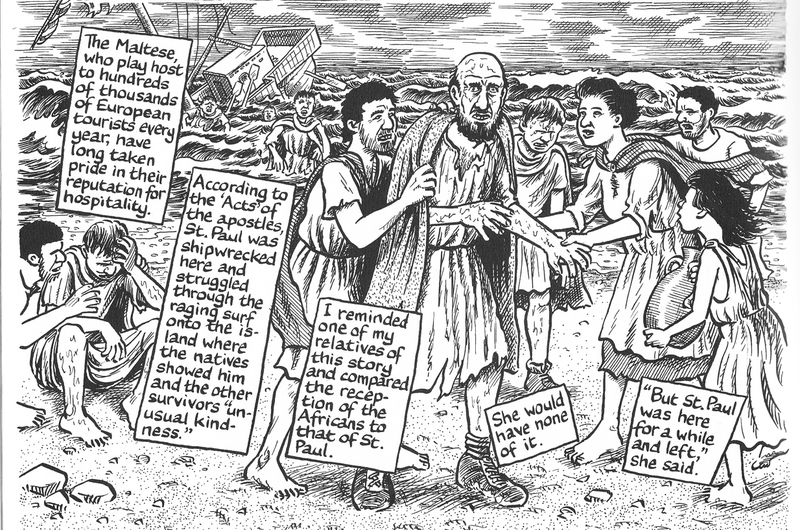 Joe Sacco’s reportage is presented in the medium of cartoons. His images are dazzling and detailed, though the scenes he depicts are more often than not ugly and awful, and his faces are *never* pretty. His most recent book, simply called “Journalism,” collects some of his shorter pieces and takes the reader to Chechnya, Iraq, India, Malta, The Hague, and back to Palestine (the subject of two earlier books). I finish a Sacco book feeling a lot better about art than I do about people. As a long-ago graduate of SUNY/Buffalo, I’m pretty jazzed about the new guy, Dr. Alan Davis, whose most recent tenure was as president of Empire State College at the State University of New York. Kwantlen was smart to get Dr. Davis. I am looking forward to working with him.